Well April has arrived quickly. Spring has arrived. What an experience to see Life coming back into the surrounding hills. Green leaves and flowers of every color. It has been so much fun seeing kids playing outside. Sometimes after-school I play soccer or hockey ball with the kids. It is nice getting to know some of my students when I don’t have to teach them English. I am meeting new people and getting to know friends better. I’ve celebrated name days and birthdays. I’ve started to call this once completely foreign place home. And in that there is something significant. Spring in my Village has to be the most beautiful I’ve ever seen. 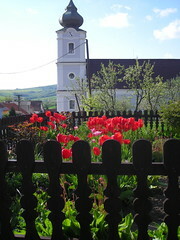 All the houses have flowers and the hills surrounding the village are filled with green and yellow pastures. The trees have blossoms and will soon bear fruit. Almost every house has a Slivka or Plum tree. In the Slovak Culture there is a name celebrated on everyday and mine was on April 25th, Marek. The name day or Menniny is celebrated like a small birthday. You receive little gifts, cards and blessings from everyone. I had a fantastic day. It was also great seeing the kids in the Village named Marek too and we celebrated together. Another small event that was really enjoyable was Pan Zigmund’s Birthday or Narodenniny. We celebrated at Spevakol or Choir Practice. He brought his Accordion and we played and sang a bunch of traditional Slovak songs. It was amazing. I’m not sure how old Pan Zigmund is but he is so young at heart. He is one my favorite people in the Village. He, the other volunteer Oli and I keep the bass section of the Choir going. I’m not sure of what else to share this month other than with what I am struggling with internally. I’m realizing how close it is getting to the time I will be leaving. It seems like the weeks get faster and faster. In one sense I’m glad to be going home but now I’m just starting to get to know people and grasp the language. I feel like my heart and my head are often in several places. In some small way I’m starting to grieve leaving. The people, the language and this place have become a part of me. My return home will be another journey all together. The Biggest struggle for me is not knowing what I am going to do next. I feel torn between home and this new place I call home. Will I come back? Will I not? Will I forget the Slovak I learned? Will these people remember me? Will I remember them? These are all really tough questions that only God knows the answers to. So as I struggle, I’m learning what trust is and embracing my fears about the future. If you expect to share the Gospel and not be changed yourself then you are not sharing the Gospel. If God is love then the Gospel is Love. Love can be painful sometimes. God has a habit of turning people’s lives upside-down. It has already since I’ve arrived in Slovakia. I’m not so sure I want it to happen again. On the other hand God’s journey are always the most exciting. If I could have one wish for all of you it would be that you would trust God and let him turn your life upside-down a little. That is when you experience the Gospel. Please continue to pray for me and the other Volunteers around the world. That we may live for you and not by Fear.